Dear Athenians, I finally made it through law school. My wife here has made it possible and worthwhile. Now go see Chip's pictures of the auction at Barnett's Newsstand. Congrats! I wanna sue our Property Owners Association nazis. Can you help?!?! 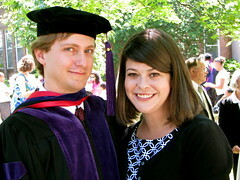 Seriously, graduating from Law School is quite an accomplishment. You should be proud. You can use me as a job reference. Congratulations. I´m going to memorize all your phone numbers in case I should ever find myself in jail! How is you new job with Krasle.